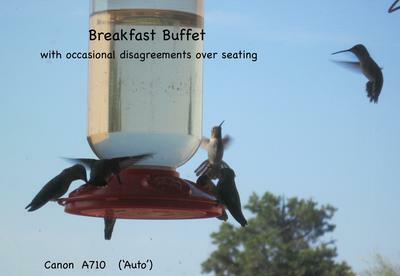 Breakfast Buffet - SRO ! We are blessed with hummingbirds year round. About 4-5 are 'regulars' here, but a couple of time a year, migrations bring 20+ to my feeders. To get just two days between refills, I have to hang three 80 ounce (yes 80, not 30 ounce) feeders. I've seen all 8 ports 'occupied' with 2-3 hovering. Of course everything thins out when "Rufus" arrives. Then the 'Breakfast Buffet', becomes 'The Battle of Britain'! Plenty of seating, but few with the courage to partake.